To proceed, you can either watch this YouTube video, or follow the text-and-screenshots guide below. Log into the child site’s WordPress dashboard, and navigate to the UpdraftPlus Settings page. Next you will be asked where is your UpdraftCentral dashboard located, if it is hosted by us then choose UpdraftPlus.com other wise if it’s hosted by you then select the other option for a self-hosted dashboard. 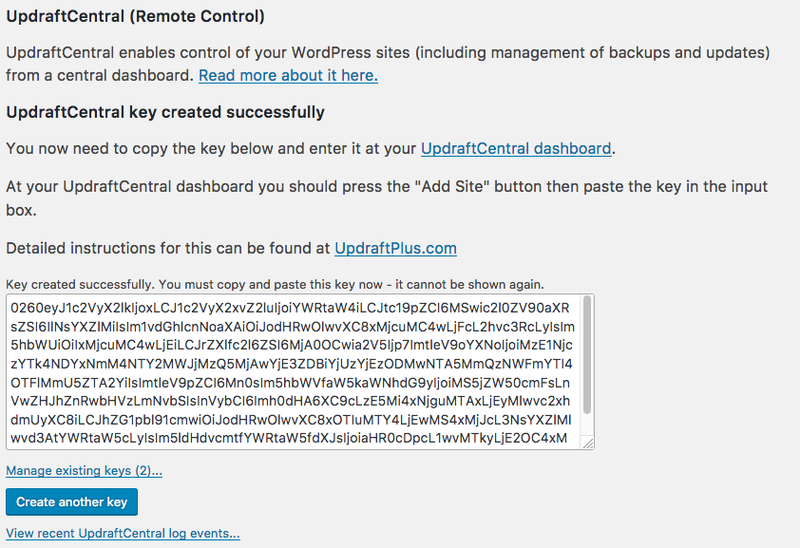 If your dashboard is hosted at UpdraftPlus.com then the next step is easy just press the create a key button, this will then generate a key for you ready to be copied to your dashboard. Most users won’t need to change the key size or the connection method, but if you do then change these before pressing create. If required, you can select to use the alternative connection method. You should use this if your dashboard is running on localhost and your child site is not – or if the default method fails. If in doubt, try it – it is harmless. If your dashboard is not hosted at UpdraftPlus.com then next you need to enter the URL of the site which does host your dashboard. Once you enter the URL press next and you will be taken to the next step. You should see that the description for the site has already been pre filled with the sites host name you can leave this as it is, or you can change it to something else as it’s just a label. Again just like if your site is hosted at UpdraftPlus.com at this stage you can just press the create key to generate your key ready to be copied to your dashboard. 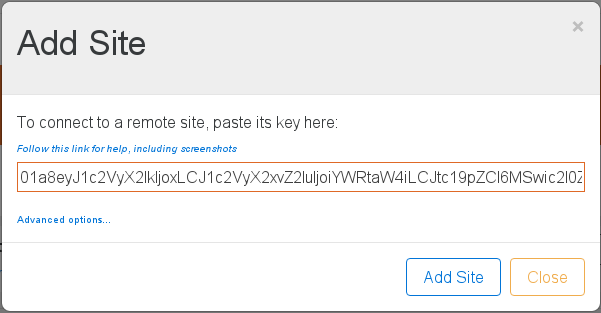 UpdraftPlus will now generate a new key, and display a success or failure alert. After the key is generated, it will be displayed below the instructions. Copy this key to the clipboard. Please note that this key will only be displayed once, so please ensure that it has copied correctly before closing or reloading the page. A confirmation message should appear, indicating that the connection was a success. The exact appearance of this message will depend upon whether the “alternate” confirmation method is being used, or not. 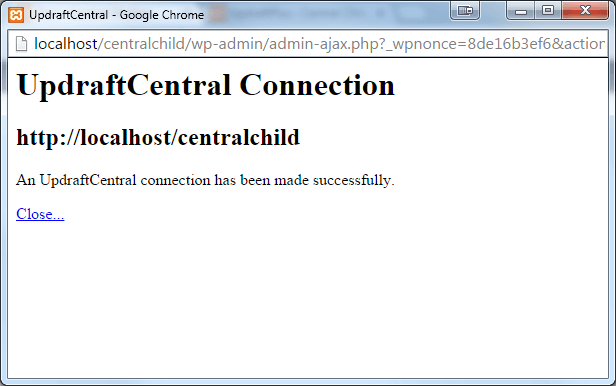 The child site will then be added to the list of sites, ready to be remotely managed.